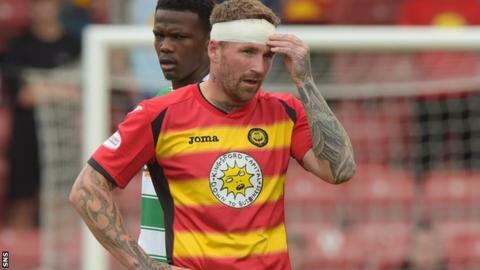 Partick Thistle forward Ryan Stevenson says he cannot help taking personally the comments made by John Collins about Celtic's domestic opponents. The Celtic assistant boss has drawn both support and criticism for stating that players in Scotland are "not clever enough or quick enough thinkers" to punish his team when attacks falter. "I respect John Collins, he seems a nice enough guy," said Stevenson. "But the way the quotes are, it's as if I'm not good enough to trouble Celtic." The 30-year-old was part of the Partick Thistle team beaten 2-0 by Celtic on Sunday at Firhill. Stevenson told BBC Radio Scotland's Sportsound programme: "He's at the top of the tree at Celtic. He shouldn't be saying that. It's pretty poor." "Sometimes, we switch off and think it doesn't really matter, because they're not going to punish us. If you become open and detached from each other against good players and good teams, you'll be punished. "It's something that doesn't happen to us in Scotland. No disrespect to the other Scottish teams, but they're not clever enough players or quick enough thinkers to punish us." Michael Stewart was part of Collins' Hibernian squad in season 2006-07. He said of his former manager on Sportsound: "I think those comments are clumsy, they are not clever remarks to make. "From my own experience, having worked under John Collins, that was one of the big issues, that his communication skills weren't the best. "He wasn't able to get his message across, when his message at times was a very good message. "This is quite similar in that the core point he is trying to make, there's substance there, but the way he has gone about it, the other clubs have taken umbrage to it because it's a disrespectful comment. Stewart believes the essence of Collins' point is accurate but feels he is wrong to appear to dismiss Celtic's opponents in one broad sweep. He continued: "There is an element of what he said that I don't think anybody disagrees with, that Celtic are the best team in the country and that the challenge they face in Europe is stronger than domestically. "But John Collins has sort of blanketed everybody as being incapable of troubling Celtic. "It's the generalisation that comes across as if 'there isn't anybody good enough in Scottish football to punish us'. "As a footballer, if you're being classed as not clever enough on the pitch, that's a sore one to take. "I think that privately John Collins does believes that the other teams in Scotland don't give Celtic enough challenge. "He has allowed that opinion to come across as if every player in the country isn't quick enough and clever enough to punish Celtic."